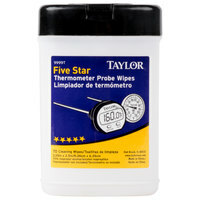 Quickly clean and sanitize thermometer probes with Taylor 9999T anti-bacterial thermometer probe wipes! 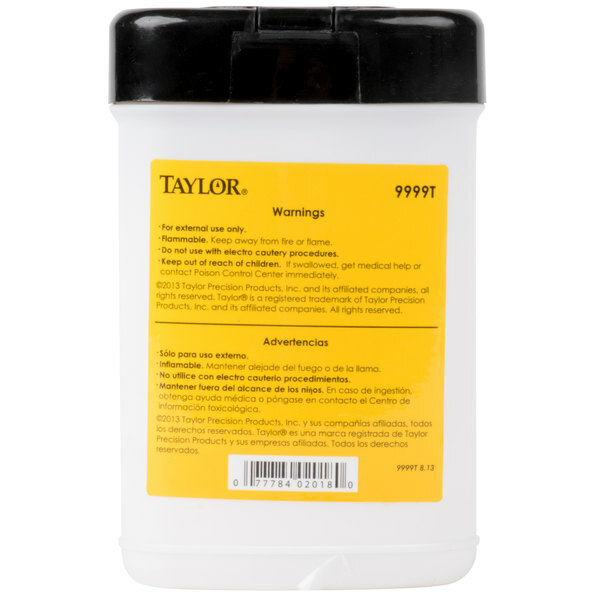 These Taylor 9999T anti-microbial thermometer probe wipes feature a concentrated formula made of 70% isopropyl alcohol to help eliminate cross-contamination and the spread of bacteria in your commercial kitchen. It's the perfect addition to restaurants and catering kitchens that deal with a variety of meats, both raw and cooked. "Great to have on hand when testing meat temps. Extra great to have on hand when the health department is snooping around and looking for points to ding! Have a few handy just incase! The clean the probes well right after use." Simply swab the thermometer's metal probe with one of these wipes, and you're done! You can also implement it into HACCP plans to promote superior food safety. The wipes come in a convenient, pop-up dispensing tub, allowing staff to simply pull one wipe out without touching the rest. It's also resealable to keep the wipes moist, ensuring they don't dry out in hot and humid kitchen environments. Use this one-step sanitizing solution to prevent food-related illnesses in your restaurant! These small probe wipes come in so handy. We run a very busy high production kitchen and we are constantly using thermometers. This makes clean up a breeze. #1 These are good to have around for health inspections #2 they work! #3 they are convenient! #4 dumb proof, sometimes people don't make the best choices when it comes to food safety...this one is hard to mess up. A necessity to keep around for overall ease of cleanliness and making sure everything is on point for the health department. I keep them next to my thermometers to make sure the employees know to use them. These wipes are super convenient, great to have around since most thermometers can't go through the dish washer. The lid doesn't really shut all the way though so pay attention to that. What a wonderful, food safe option to have to clean your thermometers. I wish these were available years ago, this makes life a whole lot easier. These thermometer probe wipes are a quick and easy way to clean our thermometers, especially while trying to maintain cleanliness in the middle of a rush. These are handy to have around for your thermometer for the times when you need to sanitize the thermometer in between checking the temps of various foods without having to continually wash. The probe wipes are affordable and well packaged. They sanitize with the usual ingredients, and the dispenser is easy to use. The individual wipes are large and moist, making them easy to use. Great concept and design love the way it pops out and the next wipe is ready in the container. Ours came with all the wipes quite dry to start out with so maybe the plastic bag they were in was not sealed but the idea is great and they would work well to sanitize quickly with even one hand if the wipes were moist. One of the main things we teach our kids in the house and revolving around food prep is cleanliness and being sanitary. These anti-bacterial wipes help display that point. They come nicely packaged in the canister and are easy to grab and use when we need to quickly wipe utensils and meat thermometers. Great to have on hand when testing meat temps. Extra great to have on hand when the health department is snooping around and looking for points to ding! Have a few handy just incase! The clean the probes well right after use. We use these wipes constantly with our stem instant read thermometers. They work very well, and as always with everything I buy here, the price is good. I purchased these as an effective way of combatting cross contamination and as a time saver. The wipes are in a convenient container and work great. These are really handy when testing multiple items while being busy at the grill. I do not like to have to worry about testing a chicken breast and then test a steak and these wipes solve that problem. We needed something to disinfect our thermometer between uses and this is the ideal thing. We love them and will reorder soon. It's a great product. It’s important to ensure that your good-intentioned temperature-checks don’t become a cross-contamination hazard. Some managers forget that their thermometer can become as much of a problem as a spoon used in different products. By taking a second to wipe off your thermometer between products with a sanitizing wipe, you’re drastically reducing the risk of cross-contaminating food products. These sanitizing wipes are fairly inexpensive, very easy to use, and even have a handy pop-up dispenser in the lid. These are handy if you are going to be checking a lot of temperatures. My lid broke off the first time I used it and the individual wipes are hard to separate. I will try another brand next time. We use these anti bacterial wipes in our concession trailer. They are so handy to have around and are a must to keep the thermometer probe clean. Health dept. loves them! 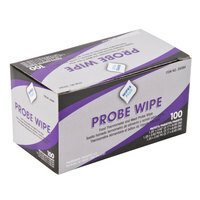 These probe wipes are the best purchase you can make. Food safety is no joke, and these wipes speed up doing food temps. They work perfectly and more importantly sterilize your probe for the next reading immediately. This is one of the best buys I made! I use these all the time, as they are handy to keep while cooking. The container makes them convenient (self-contained) and easy to grab in the middle of every thing else. I go to many sites and have not seen anything like them elsewhere. A great, necessary item to have when checking cooking temps. These are beyond handy! I love the fact you can just use these on your thermometers and not have to worry about bacteria spreading! This is truly genius! These are not my favorite thing. I've bought them a few times and the seal on the lid never is tight enough and they dry out very quickly. The health department requires that the thermometers be cleaned after each use. Using the wipes is much easier than running back to the sink to wash and sanitize. Not exactly what I was expecting. They are very dry and don't give the "sanitized" feel I was expecting out of them. I guess if they work, they work but not a great product. Thanks for reviewing this item! It sounds like you may have received a faulty product because the wipes should not feel dry. A Customer Solutions Representative will be contacting you about this. This is a nice small package of thermometer probe wipes for food safety. Easy to always have on hand. Great for preventing cross contamination during cooking. These are nice to keep on hand for your thermometers. Package is also small enough to keep in your apron pocket if you would like. Great product with a great price, the container keeps wipes from drying out. I use them to wipe my thermometer but they work on cell phones too! These are ideal and perfect to have at your recieving station. You have to have sanitizing wipes for your thermometers for the routine checking in of various meats. Very easy and quick to use. Always good to have handy for fast cleaning to keep on operating. Convenient container and the price is good. Love these wipes - so handy and nice compact size. They do not dry out like some do. I can't imagine being without them. Will definitely be reordering these. Great product to keep food safe! Excellent for cooking competitions where sanitation is a component that is vital for success. 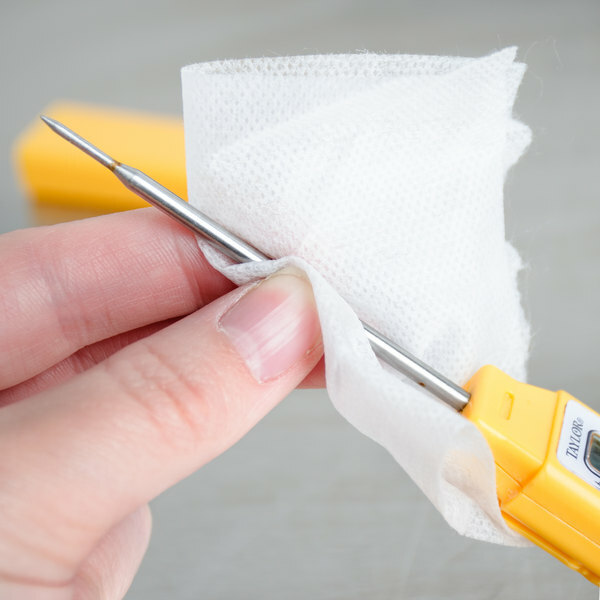 Keeps thermometers safe when taking multiple temperatures! It's actually anti-viral as well as anti-bacterial. That means it would be more effective against more illness causing pathogens. Also did not irritate my skin after use. These wipes are great to have in the kitchen. 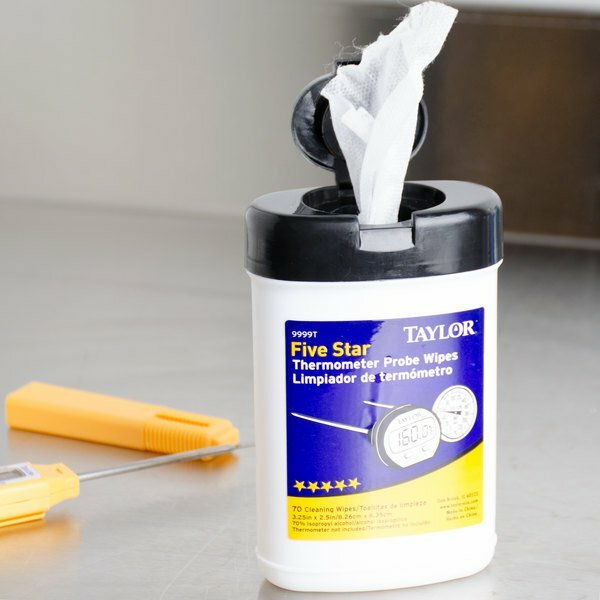 The wipes help prevent keep cross contamination when using thermometers checking temps. I use the wipes in BBQ competitions.